The Grocer magazine reported that the firm is charging £2.64 for a 250g jar. 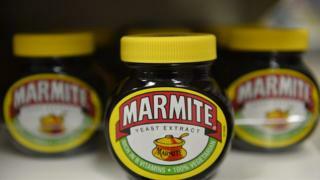 It is the first supermarket to raise the price of Marmite since the recent dispute between Tesco and manufacturer Unilever over the effect of the falling pound on production costs. A Morrisons spokesman said: "Sometimes we have to increase prices as a result of costs rising." Unilever has raised the wholesale price of many household products, including PG Tips tea and Pot Noodles, because falls in the value of sterling have increased the cost of products made outside the UK. The pound has lost nearly a fifth of its value since the UK voted to leave the EU in a referendum in June. It is the world's worst-performing currency on the global money markets this year. This makes imported goods more expensive because they continue to cost the same in dollars or euros, but the price is higher when converted into sterling. Morrisons said it did its best to avoid putting prices up. It added: "More often than not we have been reducing prices and more than 3,000 products are currently cheaper in our supermarkets than they were last year." Tesco's row with Unilever broke out earlier this month and has since been resolved, according to both sides. However, the Grocer reported that both Tesco and Asda have raised prices on a number of Unilever products, and Morrisons has also increased the prices of other items made by the company. According to supermarket websites, a 250g pot of Marmite costs £2.64 at Morrisons, £2.50 at Sainsbury's, £2.35 at both Waitrose and Tesco and is on special at Asda for £2.